This has to be my favorite Nailene product. I have been buying these since I got into nail polish almost 2 years ago. The pack I'm reviewing today is one Nailene sent me for review, but I already have about 3 of these I personally bought prior because I love them so much. 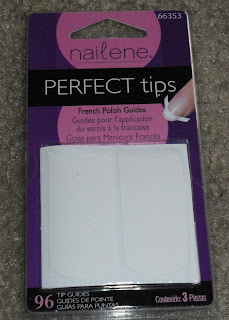 These are french polish guides that are amazing for imperfectly painted gals like myself! 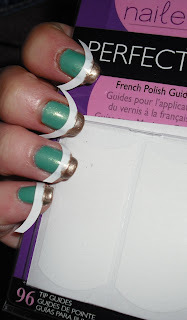 I couldn't do any cute funky french manicures without these! Nailene Perfect Tips are sticker tip guides you can use to do classic french manicures, funky french (Father's day manicure), half moon, or even nail art designs. I've used these to make curved stripes on my nail as nail art too for my July 4th mani. so you're not limited to using them just for french manicures. These are very easy to use but they are not entirely fool proof you do need to practice some patience with these. I used these the other day to do a funky french with my Sinful Colors Mint Apple manicure. I go through my typical manicure routine by applying base coat and then X many coats of nail polish (this varies depending on the polish). I then skip the top coat step and let this dry for an hour. This is probably extreme and you maybe able to get away with half an hour, but I do an hour to be on the safe side. You don't want to apply these tip guides on wet nails. It will completely ruin and pull of the polish from your nails! Not good :(! Your nails need to be completely dry. After an hour I apply these on my nail. You can put them as far down or as high up on your nail as you want it's just matter of personal preference. 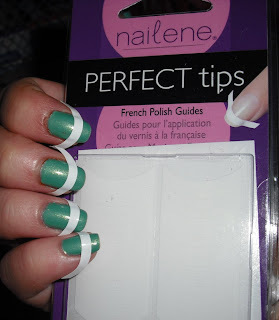 These are the tip guides on my nails after I put them on. I always make sure these are securely pressed down on my nail to prevent any uneven designs. I then paint on the color I want on the tips. The number of coats for the tip polish varies depending on what type of polish you are using. I usually use about 2-3 coats. I then leave the tip guides on and let them dry for 15-20 minutes. This is important too. If you don't let the polish dry it will pull off from the tip guides and ruin your manicure :(. After 20-30 minute drying time I pull off the tip guides and add some top coat. Then viola, you have a mess-free & stress-free funky french! I used Ulta 3 Antique Copper to paint my tips. I hope my instructions didn't sound too complicated. These really are very easy to use you just need to have some patience to let things dry. I always have a pack of these on hand. I especially love these during holiday season when I do lots of colorful Christmas manicures, but they're great for anytime of year. You get a lot of product too. You get 3 sheets of tip guides adding up to 96 guides, so these last you awhile. I definitely recommend this product. It makes my polishing experience so much better because I don't have to worry about trying to perfect my own french manicure that would be a nightmare! Excellent. I love using these as they make funky french and other designs so much easier to apply. No mess and great lines. I used to use these and I recently bought a pack of the Orly guides =( and I so need to finish using them up so I can go back to these! I loved these so much, they are WAY BETTER!!! Megan- Thanks! I love the price of these too. They are totally worth it. Lacquer- Definitely. I'm terrible when it comes to making mess, so this are a lifesaver! Aggie- I haven't tried the Orly ones, but I won't now! Smita- I'm so glad! I hope you enjoy them! I once bought some stickers like those from a cheap brand and maybe I took them off too soon, but the polish with which I painted my tips was higher than the rest of the nail, there was like a little wall between the color of the whole nail and the tip color. Like if the tip color kind of built up at the edges of the stickers. I used a normal standard white french color for the tips. Maybe the polish was too thick? After seeing your pictures, I think I'll try again. Your funky french looks very nice. I love those french guides! I got some in a swap a while ago and I had never used them before... now I can't live without them! Oh my God! I don't want to admit this, but I never knew how to use these. I've got a packet lying around in my room but I just couldn't figure it out!